"Quick, tasty and simple salad - the nuts and dried fruit make a great combo." Mix salad greens and ranch dressing together in a bowl until evenly coated. Add tomato, cranberries, sunflower seeds, almonds, flax seeds, sea salt, and garlic; mix well. Top with Parmesan cheese. If you enjoy a more moist salad make it 1/3 cup of ranch dressing instead. Very tasty and easy to throw together. Since I didn't have any almonds on hand I subbed it with walnuts. It will be a perfect summer salad to make. 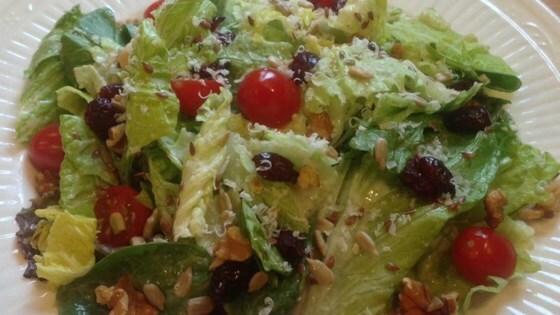 Quick, tasty and simple salad - the nuts and dried fruit make a great combo. I made this for a luncheon with 9 people and everyone loved it (even my kids went back for second and third servings. It was great that I had all the ingredients on hand too.